What is Blogger and Adsense ? You might be using Gmail.Gmail is a service offered by Google.It is free email service.Similarly Google offers Blogger.Blogger is used to create your own blogs.Blogger service is also free.So with blogger you can create free blogs.The best part is you can even make money from your free blogger blog.Similar to Gmail and Blogger Adsense is also a service offered by Google.You can use this service for free.But using this service needs blog or website of your own. Using Adsense you can display ads on your website.Each time a visitor clicks on that ad you are paid money by Google In this post we will discuss in detail about making money using Blogger and Adsense.I have tried to come up with step by step tutorial so that non technical people can also feel comfortable.But in case you have query about any step or suggestion about any step feel free to share your thoughts using comment section below the post. Write some original content (pages). You will be paid money by Google. Below We will discuss each of above steps in detail. Click this link to open Blogger.com.Sign in with your Gmail account.I would recommend creating one separate Gmail email id.It proves beneficial later.You can monitor this new mail id for all blogging related updates.It would be good if the mail id looks professional.For example my blog name is udinra.com.I have created udinra@gmail.com for this blog. After sign in you will see the below page.The page shows my Google Plus profile image and details.If you have not created Google Plus profile then you should create one.To create your Google plus profile click on this link.You should use same Email id you used to create blogger account.Then this page will also display your Google plus account details.You can create Google plus account now and refresh the page. 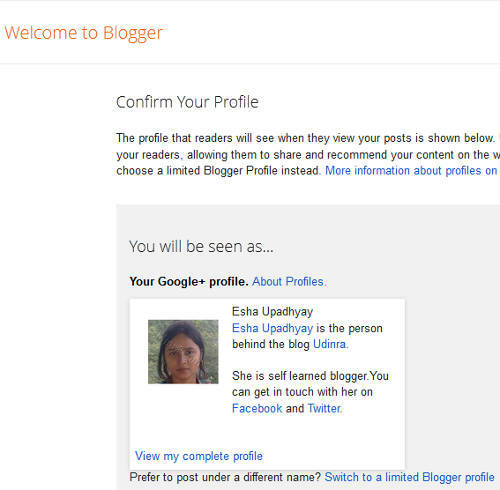 In case you are not willing to create Google Plus account right now.This is not absolutely necessary.But it is good to have.Creating Google Plus account is very simple and can be performed later on.I would recommend using full profile instead of using limited Blogger profile.A full profile increases reliability of a blog. After selecting the profile you will be directed to Create New blog page as shown in below image. You need to click on New Blog button to create your own blog.You can create more than one free blog with Blogger.All your blog list will be shown here.You can also add other blogs to your reading list.For this purpose use the button Add under reading list.This helps you check latest post from other blogs of your interest. 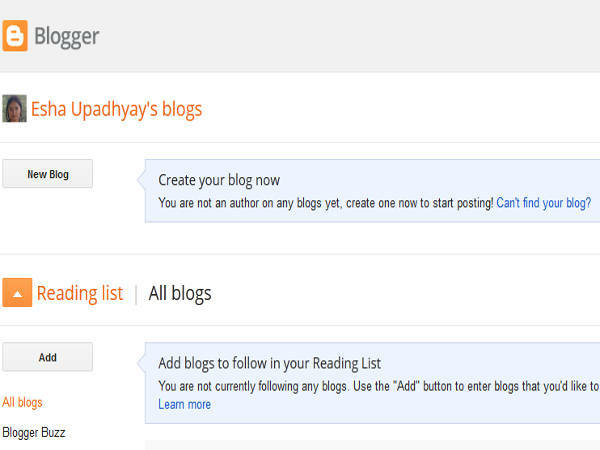 Now it is time to give unique name and address of your blog.The image shows the screen displayed after the last step screen.You can provide two very important information about your blog on this screen. 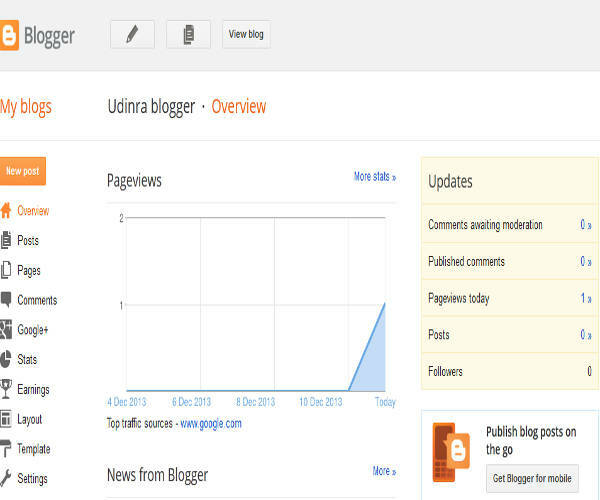 Address is URL of your website.For example udinra.com is URL of this website.Free blogs created on blogger have blogspot.com appended to them.You can use your title as address.So in my case if I give Udinra as title and udinra in address then my URL becomes http://udinra.blogspot.com. This URL is unique identifier of your blog.It is better to follow same suggestions as above in this case also. 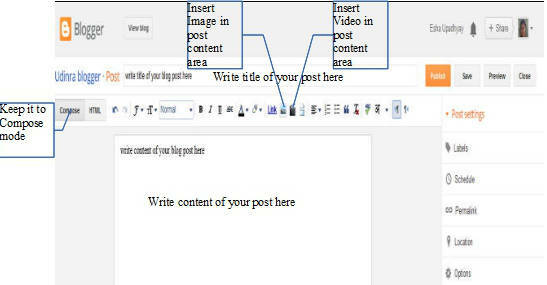 Template is the way your web page will look.You can select any template for time being.You can later change template of your blog.We will see later in the tutorial.After making above changes click on button Create blog.Congratulations you have created your own blog.Now it is time to add content on your blog.For example this page you are reading is a content on this blog.You can create similar pages on your blog.We will see the process in next steps. After completing previous step you will see next screen similar to below image.This is very important screen.All options are mentioned here.I have covered most of the options.MOst of the options are simple and are not needed right way.You can play with them or use them if required. Graph – The graph shows weekly traffic statistics. Posts gives list of posts created on your blog.Pages options list all the pages on your blog.You can think of page and post same as a web page.Normally comments are enabled on posts but not pages.This is important difference.Lets understand difference between post and page.You want to write about a topic.Then you will want feedback (in form of comments) from your visitors. But if you write about yourself then there is no need of feedback from your visitors.Every blogger give brief introduction about themself so that visitors can know about them.But there is no point letting users comment on that. This option shows various statistics about your blog.On the overview screen brief statistics are displayed.But on this screen you can see detailed statistics.Every blogger likes to see statistics about their website.It is good feeling to see your website growing with time. You can use this option to configure look and feel of your blog.You can use various widgets offered by Blogger to make your blog more engaging.You should not use too many widgets.It is better to keep your blog fast.You can view your blog and see if it is loading fine.If the blog looks too slow then make it fast by removing unnecessary widgets. Recall that in step 4 along with Blog title and address you had to choose template as well.You can select different templates here.There are lot of templates.You can try them and stick to one that suits your requirement.You should first change you template and then make changes using Layout.After making changes browse your blog to see the changes in effect.This is preferred way of selecting a template for your blog. Title – title of your blog.You set it up in step 4.You can change it here if needed. Description – One line about your blog. Privacy – No need to change. Blog Address – you can change URL of your blog here. Blog Authors – IN case you want to add more than one author for your blog then you can use this option. Show at most – Number of posts you want to display on front page of your blog.If unsure leave it unchanged. Leave all other options as it is. You can enable or disable transliteration.Change it according to your requirement.If you are posting in English you can disable it.You can write blog in any language.You should set your time zone according to your country. No need to change any option. If your website has adult content then make Adult Content to Yes. Google Plus is social networking website from Google.You can integrate Google Plus with Blogger.You can automatically share your posts to your Google plus profile.You can also use Google plus comments on your blog.I would recommend using Prompt to share after posting option.This will help you control which post to share. Also you can use Google plus comments on your website.But visitors have to sign in using their Gmail account to comment on your website.I would recommend not using it initially. 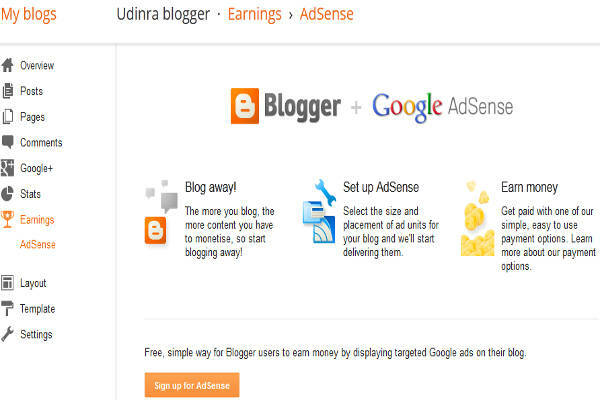 I promised that you can make money blogging for free without investing a single cent with Blogger and Adsense.Above I have covered mostly Blogger so that you can get started with your blog.Now it is time to look at Google Adsense.You can place ads on your blog using Adsense.After adding ads you will get paid for clicks on that.Now this is the tricky part.Most new bloggers self click on ads or tell their friends or relatives to click on that.I would request not to do that.Google will catch you and ban your Adsense account forever. But every website does not get approved by Adsense.They have many terms and conditions.I have written detailed post here.You can read the post and check whether your website meets the standards.It is not difficult to get approved if you have sufficient original content.You can get in touch with me in case you have any questions.I would love to answer your questions.But please use comment form of this article for all queries. After reading this long boring tutorial you might have forgot that we have not discussed about creating new posts and pages.A blog is meaningless without posts.You can visualize post as something News you read.Every news has one title,then follows the content and then the comment section. The page displayed looks as shown below.I have shown the places to write post title and post content.You should keep it to compose mode instead of HTML mode.To insert picture into your post click on the image icon shown in the image and to insert video into your post click on the video icon as shown in the post. Publish – Publish the post.All visitors can see the post after this action. Save – Save the post.It will be not viewable by your visitors.you can later publish it. Preview – You can preview your post.You can only see it. Close – Close the post without saving the changes. You can leave all other setting. So start creating great content and then make money using Adsense.You might be the next big blogger in market.But on that day do not forget this starting tutorial 🙂 Consider sharing this post in case you found this useful.Feel free to share your queries and thoughts. Mam there are blank ads showing on my blog . What can I do?? There is no such restriction. However custom domain gives you more control in case you want to migrate from Blogger in future. It also gives you unique identity. You have to access back end of the website..view source gives only generated html code placing any thing there will not help..you need to add the ad code on code generating the HTML page. Are you using WordPress or other content management system. Google Adsense payment depends on lot of factor like the topic you are writing,the advertisers bid for the ads shown on your site..It is best option for making money online from advertisement. Nice..surely I create my own blog..with in ages days ..